Have you always been a fan of Seurat, making art out of little dots? I am too, but the thought of making all those little pointillism dots everywhere to make a picture sounds like preparation for a long horrible afterlife to me. So, instead I prefer to have my dots all pre-made for me in the form of little tiles that I can put together in tile mosaic crafts. I had a lot of fun making video character tile crafts out of them, they were great for hanging on the wall in the play room over the Nintendo. One of these days I'd like to do it with some Minecraft characters too. 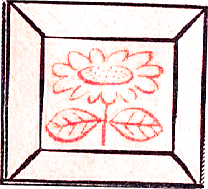 Buy ready-made frames to fit ceramic tiles. Design a few ceramic tiles with the same theme (here are instructions for placing designs on tiles) Then hang them up in the same room and let everyone ooh and aah over them. 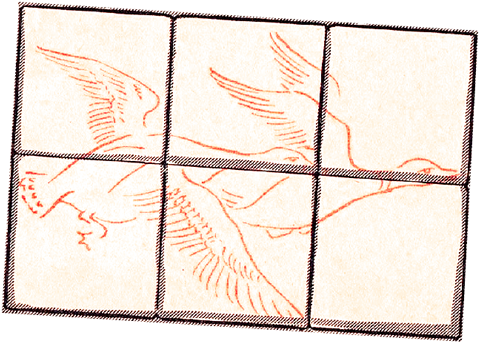 Following directions for decorating tiles design, trace and decorate the three tile as if they were one. Buy a ready-made frame to fit. Cement tile to frame with a non-staining adhesive. Decorate the six tiles as if they were one, follow ing direction here. Cement to table to or tray with non-staining adhesive. Below you will find many more ideas for crafts using tiles. Paint and Fire Ceramic Tiles without a Kiln - Don't have a kiln? No problem, learn how to glaze & fire tiles without a kiln. Make a Tiled Retro Super Mario Bros -Find out how to make this super cool Super Mario Bros picture ... this is the classic, retro Mario made with tiles. 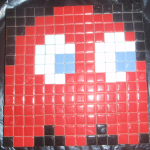 How to Make Mosaic Red Pacman Ghost with Tiles - Learn how to make this classic Red Ghost from Pacman with tiles...we have the pattern, you just need to make it. 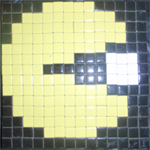 Mosaic Tiled Pacman Pixelated Art - Learn how to make this classic video game character...Pacman. We have the Pacman Pattern...find out how to make this tiles creation...called a Mosaic...with the following lesson. How to Make a Mosaic Super Mario 1-up Mushroom Pixelated Picture from Paper Tiles - The 1-up mushroom can give you an extra life and its hard to find. If you are the Super Mario video game lover you are going to want to do this craft. 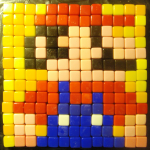 In this post I will show you how to make a mosaic Super Mario 1-up mushroom pixelated picture from tiles. Fun, fun!! 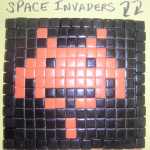 Mosaic Space Invaders Character with Tiles - Learn how to make a Space Invaders Creature with Tiles. Decorate Your Notebooks in Mosaic Squares - This notebook is decorated in little paper squares - you can make any design you want - this one just happens to be Mario in a Yoshi suit. Beach Mosaic Art Paper Tiles Craft- - This tropical scene sparkles with brightly colored Venetian tile. The beach mosaic is a great family vacation project and makes lovely decorative wall art for your vacation home or create a vacation-feel right in your very own home. Bug or Lizard Pin Decorative Tiles to Make - - Gild a bug or lizard shape and decorate with beads and wires. These bugs can become unique pins or decorative tiles. Ceramic Tiles Place Mat - - This tutorial will teach you how to make a place mat out of ceramic tiles. Collage Ceramic Tiles - - Karen Landey is a bit of a gypsy by nature. Over the years, she has had more than 50 addresses. The places she’s seen are an influence on her work. Karen does collage work on ceramic tiles. In this segment, she makes a tile inspired by her trip to Egypt. Colored Tile Thank You Cards to Make - - Introduce unusual household materials to your cardmaking routine. Here's a project that teaches you how to use bathroom tile for your homemade thank you cards. Halloween Drink Coaster Tile Craft Project - - This simple and easy Halloween craft project is perfect for kids of all ages. I love this simple Halloween drink coaster craft project because once you make your Halloween craft project it can be used for a variety of purposes. Handprint Tile Making Directions - - I love handprint tiles. I have quite a few of them in my curio cabinet. Each year the handprints get bigger and bigger...sigh. This craft is a fast and simple craft that would make any parent or grandparent smile. Hand Stamped Coaster Tiles Craft Project - - In this tutorial you will learn how to hand stamp tiles which could be used for decorations or for a coaster. Holiday Photo Ornaments Arts and Crafts Ideas - - Use different colored polymer clay to make a customized ornament perfect for any holiday! How to Decorate Clay Pots - - Clay pots are a great base for a variety of decorating projects. Brighten a window sill or patio with painted, stamped or mosaic pots. Decorate pots with silk leaves, buttons and more. Let these instructions inspire you to your own creations. How to Make a Child’s Handprint on a Ceramic Tile - - This is a fun craft to do with a group of moms and their kids, one child per adult works the best. Mosaic Bath Jar Set - - Bathtime is bright and cheerful with these colorful mosaiced canisters. Just fill them with your favorite herbal bath blends and aromatic bath salts and display them tubside. Mosaic Flowerpot - - Preserve old treasures and create a useful gift in the process. Mosaics - - There is no special secret to mastering mosaics, one of the most rewarding and popular of crafts. Start with a smaller project then larger pieces will become easier. Mosaic Spheres Glass - - Get the look of stained glass in your home. If you put the glass mosaic spheres in a window the sun may make it shine like no other. Mosaic Sunflower - - This pretty mosaic sunflower design will bring the colors of summer into your home. It works great as a trivet or as a decoration on any of your home decor like a flower pot or decorative wall art. Rooster Mosaic - - This mosaic feathered friend will make a perfect trivet or tray for your breakfast. Remember, the early bird gets the worm! Stenciling - - Visit a Colonial home and you'll notice the use of decorative painting. Wallpaper was very scarce and even paint was not readily available. In fact, the use of certain pigments indicated wealth. Stenciling adorned many surfaces but especially walls and ceilings. This project introduces stenciling on a fun decorative coaster in the traditional Pennsylvania Dutch style. Stencil Tiles - - These cheerful ceramic stencil tiles are an indoor craft that will lift spirits and hearts. Making lovely tile works of art is an easy kids' craft that will please friends and family or cheer up less fortunate strangers. Thanksgiving Mosaic Platter Project - - Normally my crafts are much less involved, but I used to do a LOT of mosaic when I crafted for a living, and I really miss it. This does take several days to complete because of the drying time involved with adhesive, grout and polyurethane. Tiled Topiary Eggs and Tree - - This project creates an elegant decoration for the kitchen or bathroom with mosaic tiled pastel colors. Or use this concept for a totally unique Easter decoration that's unlike anything the neighbors will have. Tile Word Art - - A friend of mine gave me ceramic tiles she had left over from her bathroom. She knows I paint on anything that stands still! Word Art is so popular right now. I decided to make the tiles look like stones. They can then be hung individually or in groups. Wax Sculpture - - Make a candle design on top of tile. Lovely decoration everyone will want.